Hot on the heels of the global successes he had with his claustrophobic (anti)war movie Das Boot (in 1981) and the fantasy adventure: Die Unendliche Geschichte (internationally known as: The Neverending Story (in 1984), director Wolfgang Peterson turned to Science Fiction for his next project and delivered his first film produced in the English language: Enemy Mine,based on a short story by Barry B. Longyear. 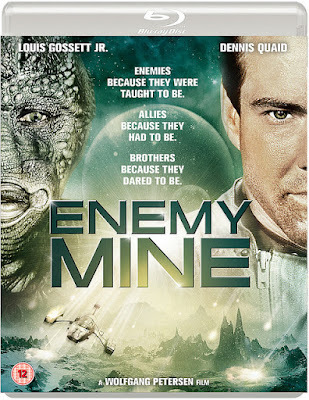 On the distant planet Fryine IV, at the height of the war between the Dracon and Terran Empires, two military pilots crash in the heat of battle. One of them. 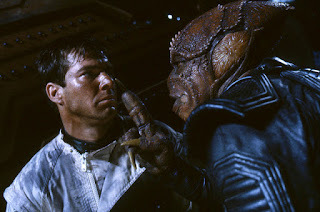 Space pilot Willis Davidge (played by Dennis Quaid) is Terran, the other one, Jeriba Shigan (played by Louis Gosset jr.) is Drac. Each of them is a repulsive alien to the other. Each is a professional warrior, filled with hatred for his blood enemy. Now, marooned on a hostile world, they have a choice. They can complete their missions in a mutual pact of violence and death. Or they can do the most painful thing any Human or Drac has ever done: reach out and begin the new age of understanding that is struggling to be born. 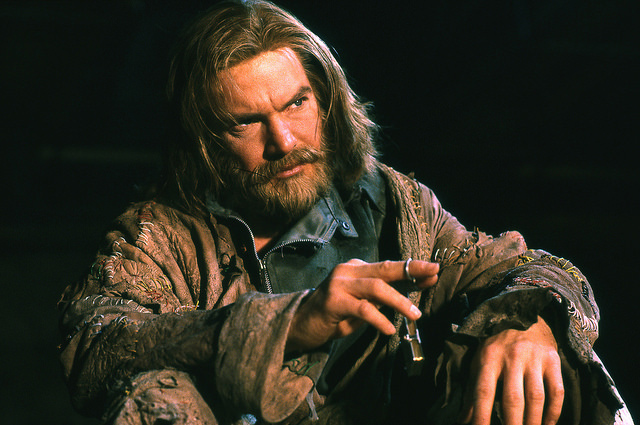 Peterson wasn’t the first choice, Terry Gilliam for instance, had turned down the offer (and chose to make Brazil instead), and his successor Richard Loncraine was fired by the studio, even though filming had already started. 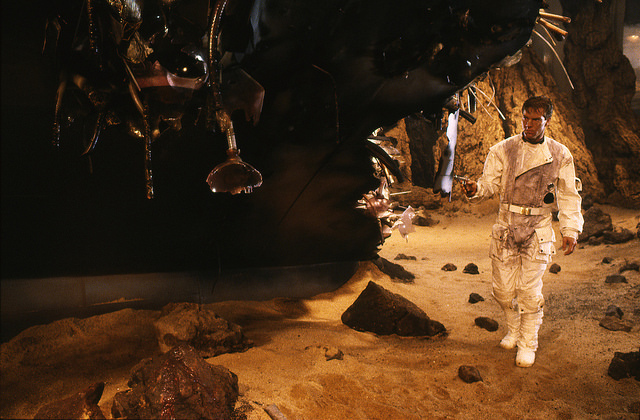 When Peterson accepted the job he decided not to use any of the footage already shot and relocated a great deal of the shoot from Iceland to the Bavaria Studios in Munich (even using some of the sets used/built for Das Boot and Neverending Story) with some of the outdoor scenes being filmed at Lanzarote. It had been a long time, since I had seen the film (it was never properly released in the Netherlands, so my memories were solely based on my repeated VHS viewing). This made the viewing of the Blu-ray extra special. The images are crystal clear, as if the film had been shot recently and the colorization is crisp as well. At the time of viewing, not all extras were available, but one of them that was available, was an extended version of a scene in the latter half of the film, that hadn’t been enhanced (and was even presented in the German dubbed version), making the comparison a lot easier. Even though the film itself suffers from the 30 plus years that have passed since it’s original release, the special effects from ILM rather disappointed me, the battle in space really looked like a bad videogame in my opinion (but maybe that was because the image had been so clean, so I noticed all the details). The look of the Dracs however (who were designed by Chris Walas) are really out-of-this-world. Like I said, the image is very clear and when Shigan (played by a totally unrecognizable Louis Gosset jr.) talked, I could almost see every muscle in his face move very realistically. The story itself is a bit weak in my opinion, some of the action sequences seems to appear straight out of thin air, without much of explanation and the finale I found very disappointing (considering the rest of the story). The music by Maurice Jarre (who’s scores for Lawrence of Arabia and Dr. Zhivago I adore) isn’t too great either. In scenes where I would expect (a lot of) music (that’s what listening to (too) much of the scores of John Williams does to you), I encountered mostly silence and when the music was occasionally heard, the themes weren’t very memorable I’m afraid. All in all the film slightly disappointed me, but the crystal clear image and sound made up for that on most of the occasions (and repeated viewing does work in the film’s favor). 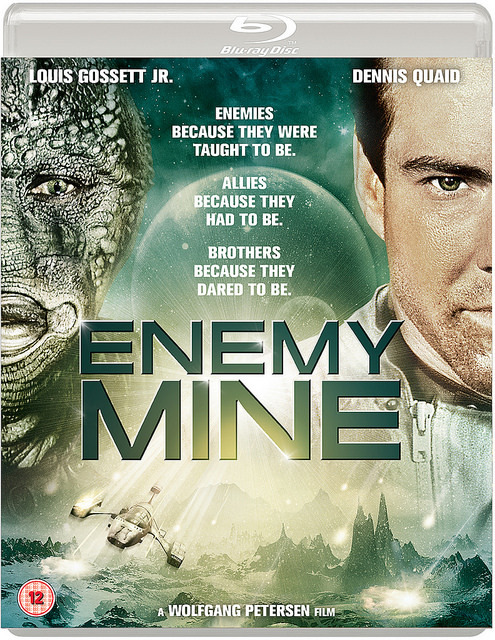 so overall I would give this Blu-ray edition of Enemy Mine ****1/2 (out of 5).